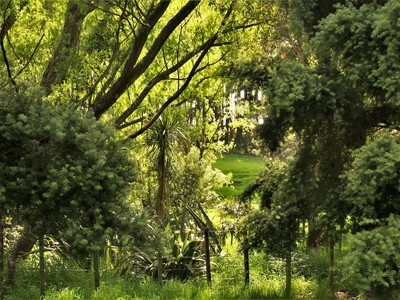 It was time again to go for a wander in Bushy Park near Whanganui. 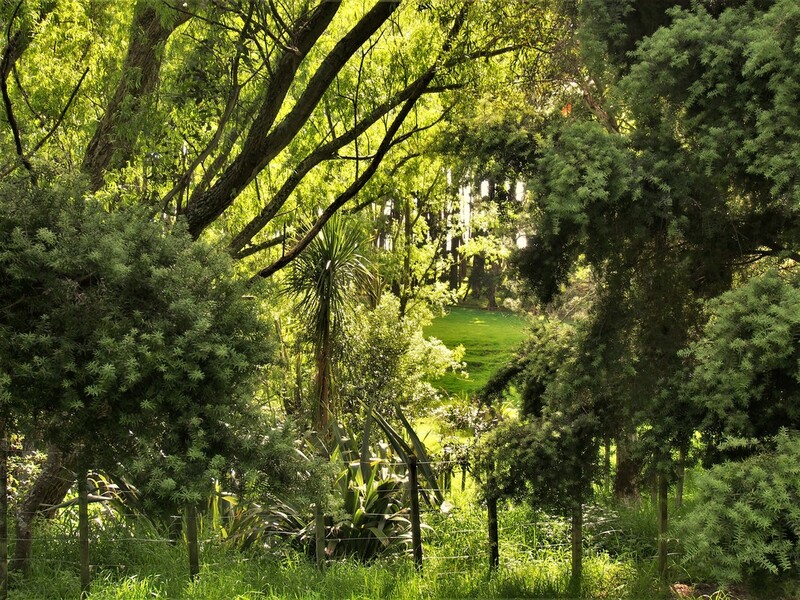 After Frank Moore gifted his homestead and bush block to Forest&Bird in 1962, the forest got framed by a predator-proof fence. 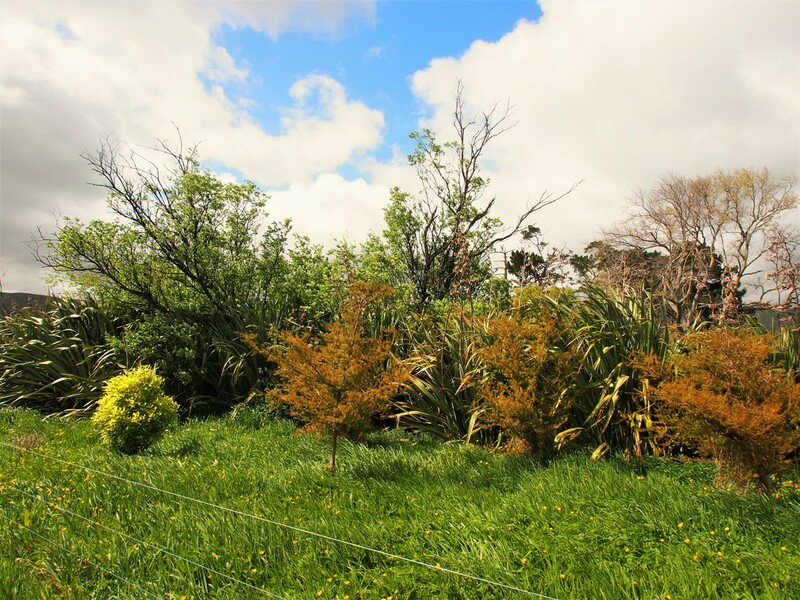 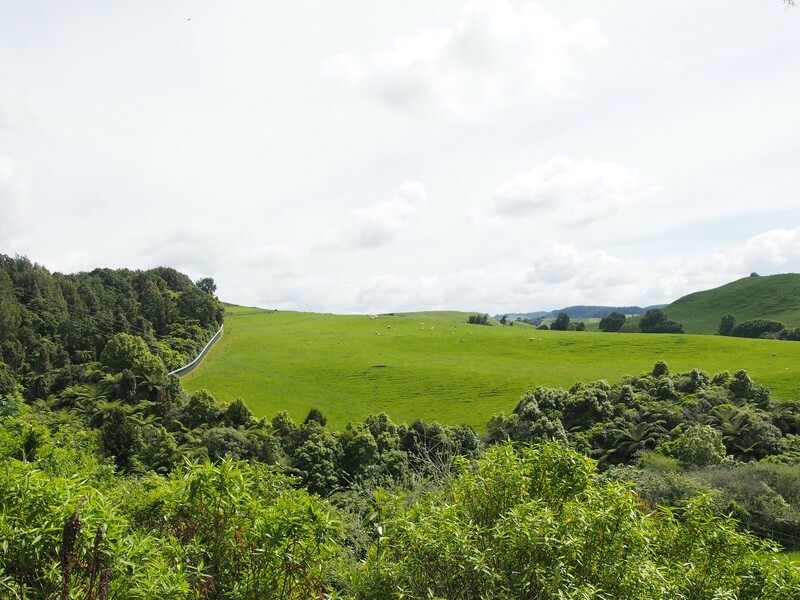 Looking out from the homestead, the fence marks a clear boundary between mature native bush and green hills with grazing sheep. Esther Williams, our guide, has been volunteering for Bushy Park for over 10 years to turn it into the predator-free bird sanctuary it is today. 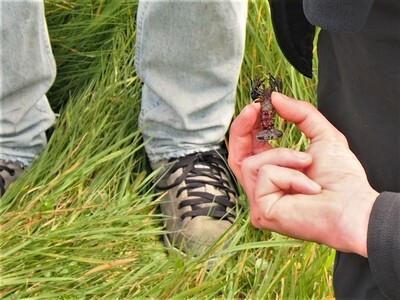 After a stop in the wetlands to catch some crawlies, we followed the bush tracks with our cameras ready. 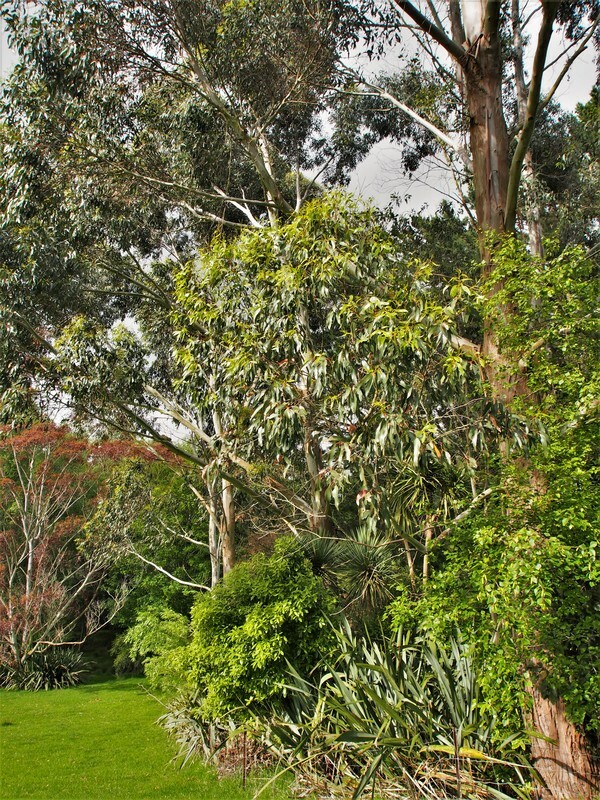 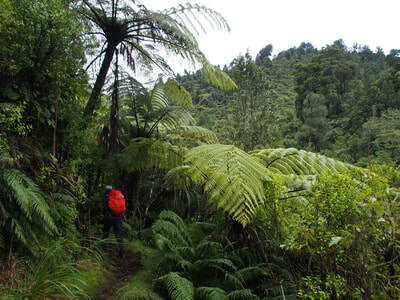 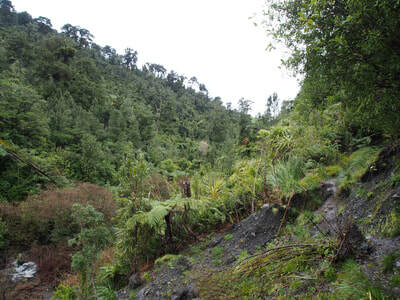 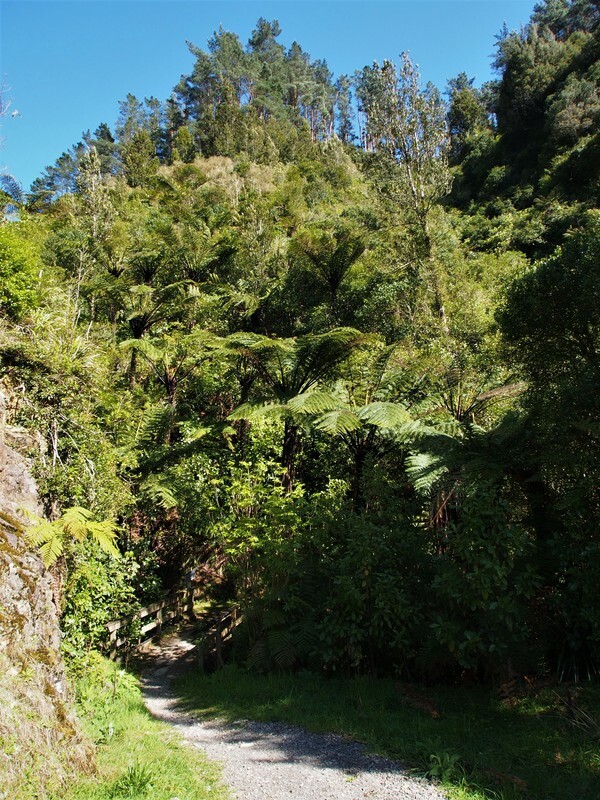 The bush was alive with calls from toutouwai/robin, tieke/saddlebird, kereru, tui and others. 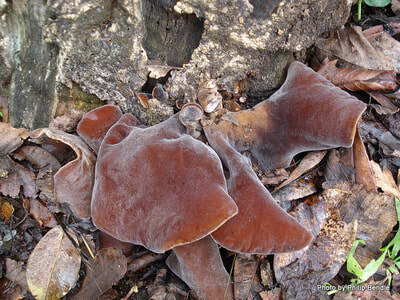 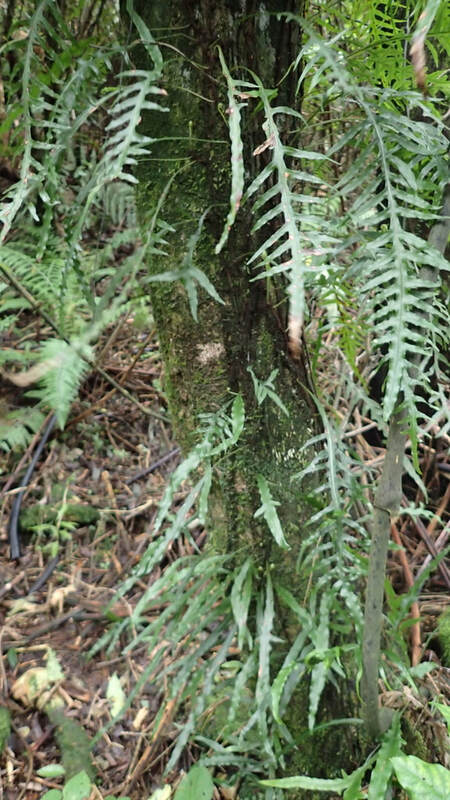 And soon we saw them everywhere, hopping from vine to vine and boosting straight past our heads too! 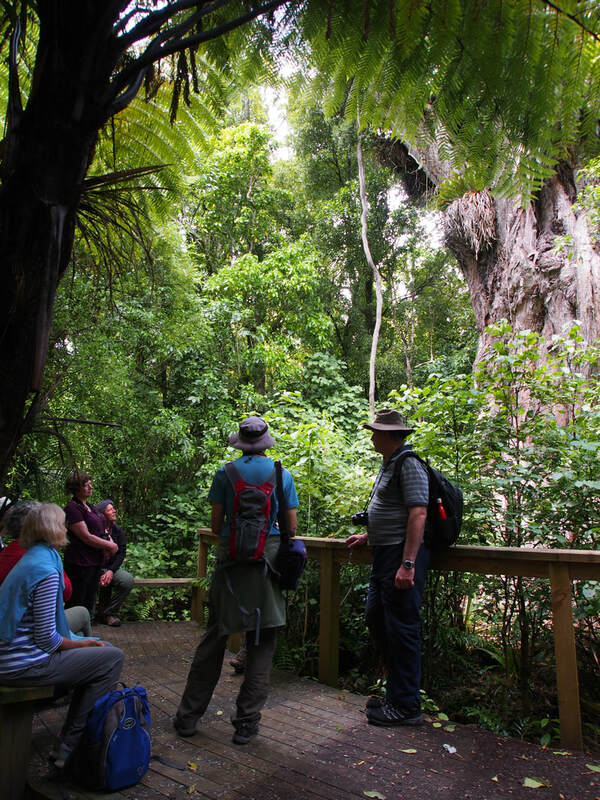 The birds and the impressive trees (among them: Ratanui, the big rata tree) ladden with epiphytes and vines reminded us of the way NZ used to be. 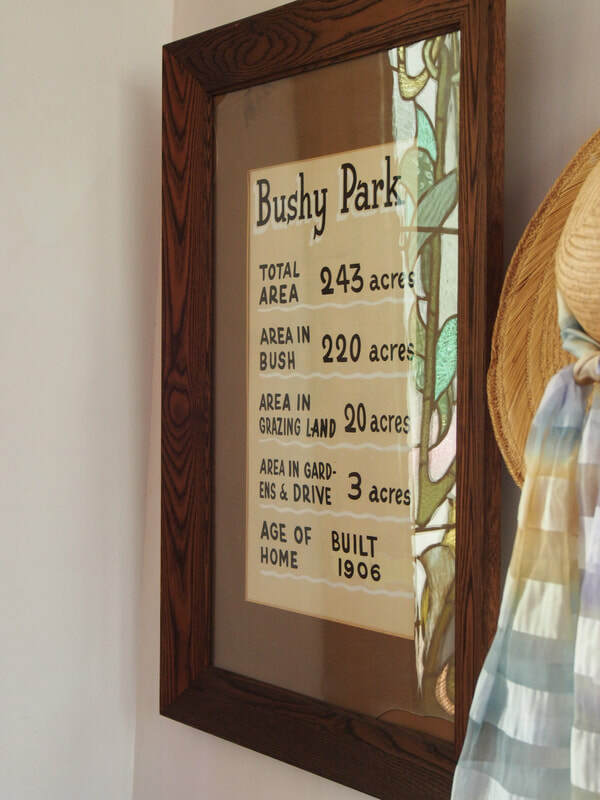 Bushy park shows us how much effort it takes to bring back what got lost - but also that it is possible! 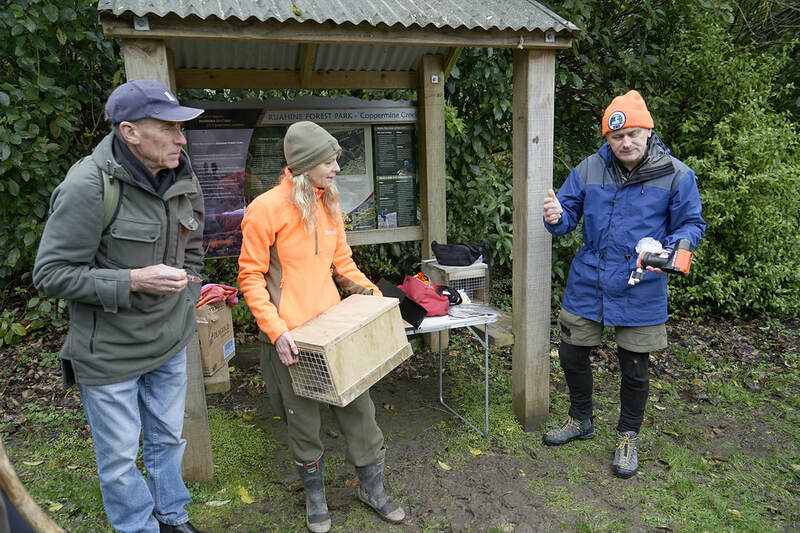 Esther showed us a variety of traps and tracking tunnels along the way, and we stopped at the hihi/stitchbird nectar feeding stations to watch them fly in and out. 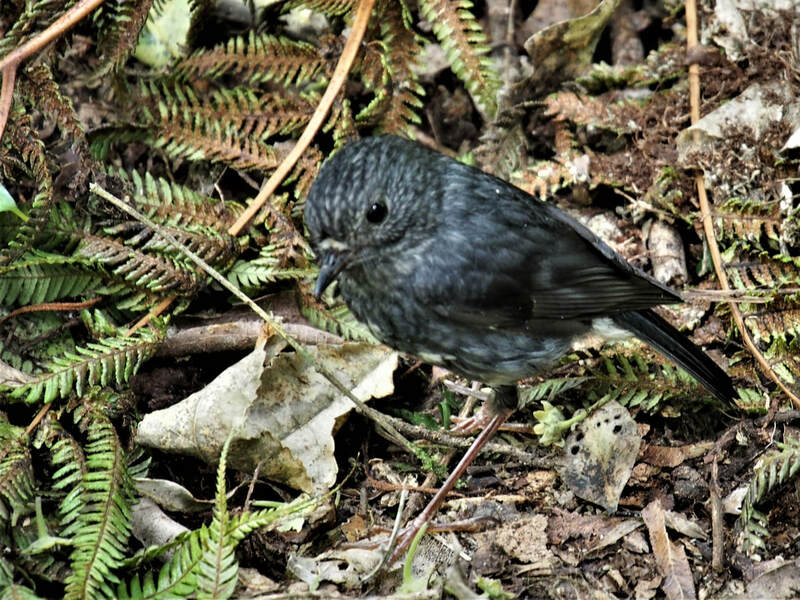 The friendly robins were not afraid of our big group and came very close. When we closed the gate of the predator-proof fence behind us and were back in the homestead gardens, we could still see and hear lots of native birds. 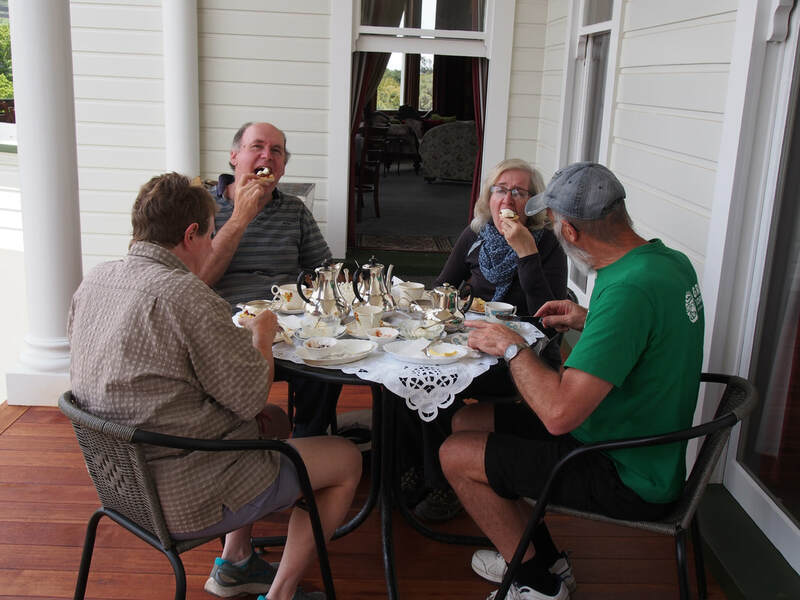 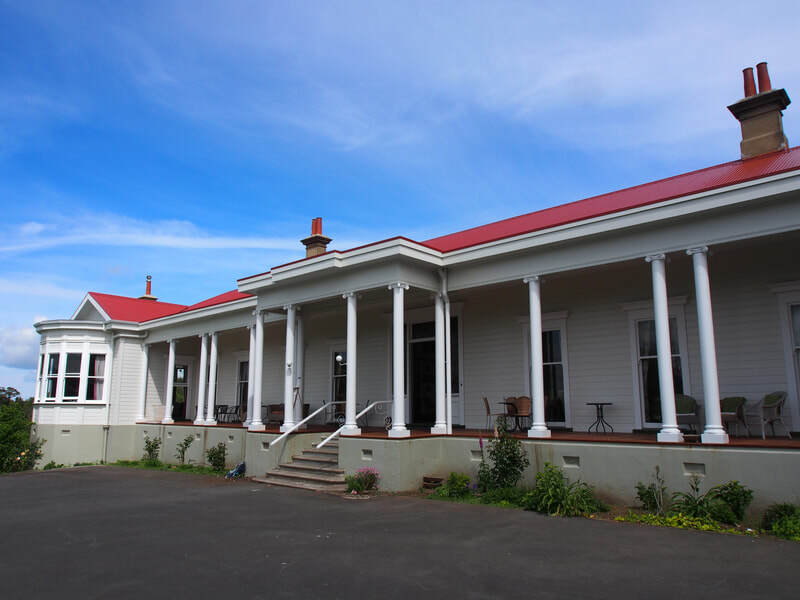 After a coffee in the beautifully renovated homestead and a look through the house, we made our way back to Palmy. 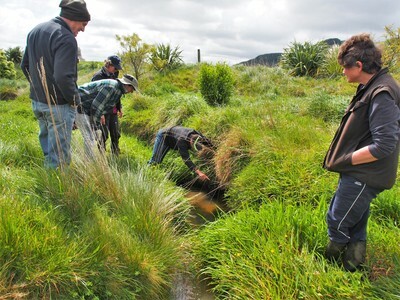 On our schedule for today were 3 local farms and their riparian plantings. 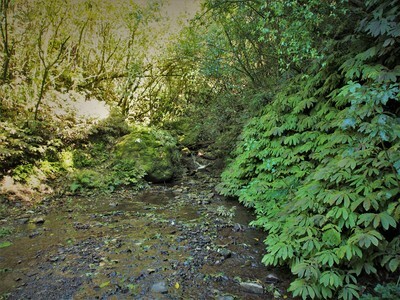 First, we stopped at Stevens block just out of town. Steven gave us an exellent tour around his place, pointed out curiousity plants and told us lots of interesting stories connected to the plantings. 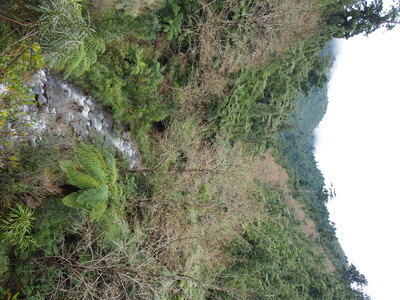 We learned about the challenges in particular areas, like valleys prone to flooding, planting up a sewage plant area or the remnants of a bamboo patch that keep appearing amongst the grass. 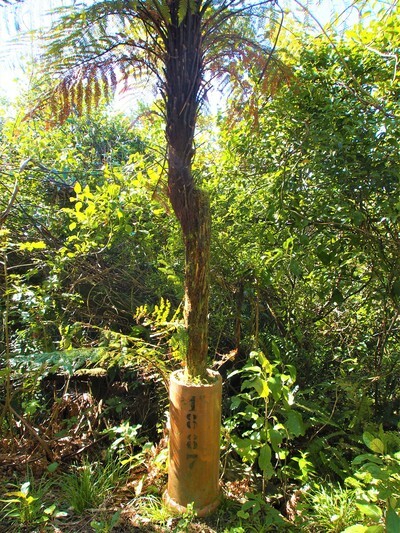 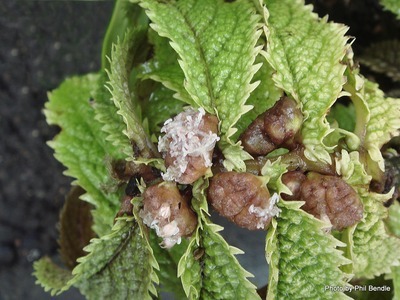 We could see how some experiments with planted natives had worked out, and some others didn´t. 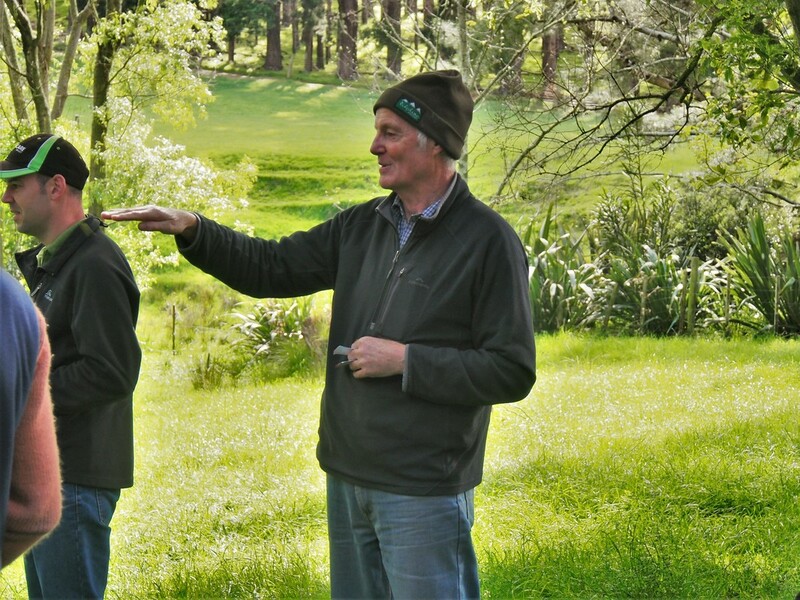 No doubt everyone got some amusement as well as valuable practical tipps for plantings out of Stevens stories! 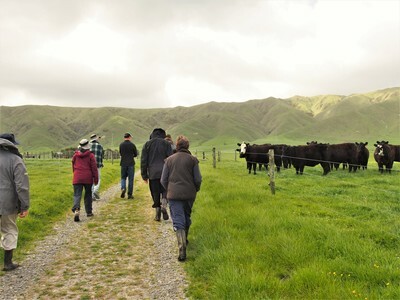 Eventually we travelled on, to a farm in Linton. 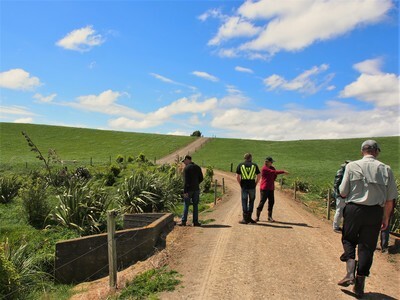 There we met Christine, a dairy farmer and environmentalist who kindly offered to show us around. 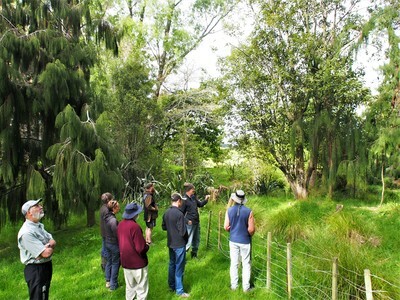 She pointed out some stream plantings as we walked along the paddocks, explaining the methods and also successes/ losses. 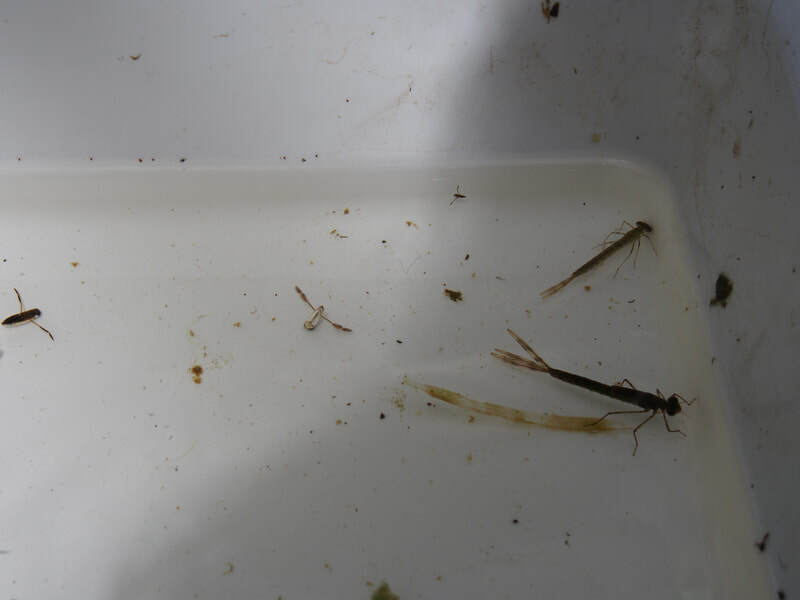 In one stream we found some residents under the rocks: Koura (freshwater crayfish) of impressive size! 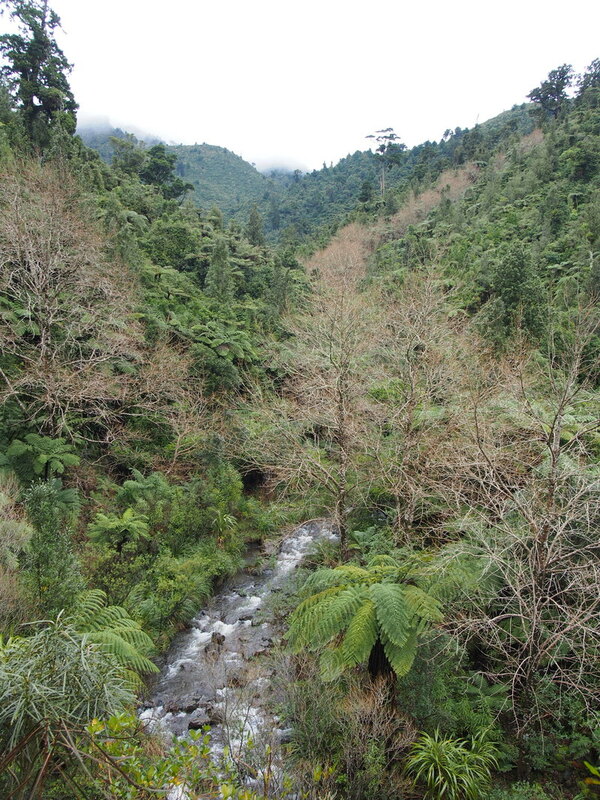 The trip turned out to be quite adventurous, as we hopped the streams, bush bashed through remnants with tall trees (great source for eco-sourced seed!) 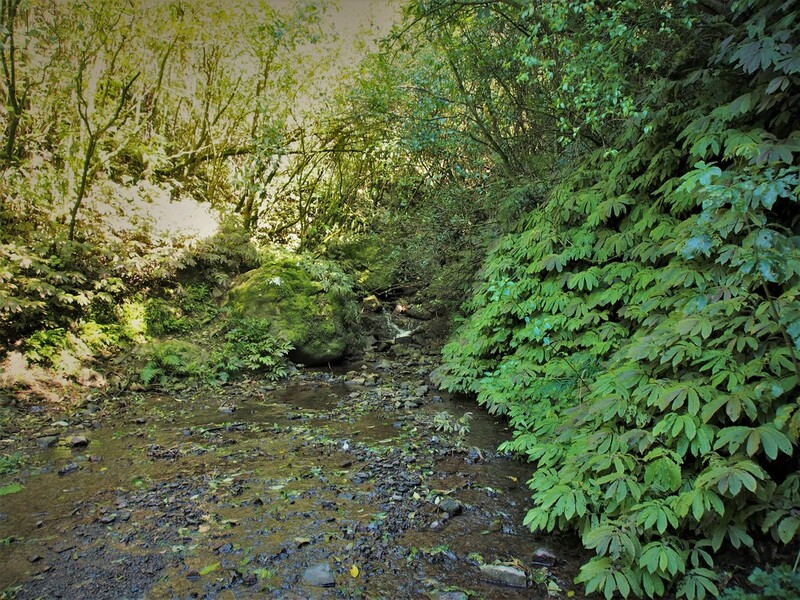 and pushed our poor 2WD car up the hill on the gravel race. After an idyllic lunch, we had a look at two other farms in the area with similar riparian plantings, a few years old. All through the long day, we had great discussions and exchanged ideas and experiences with planting. 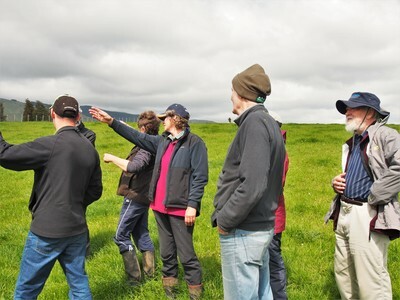 Everyone got a good picture and lots of input to think about. 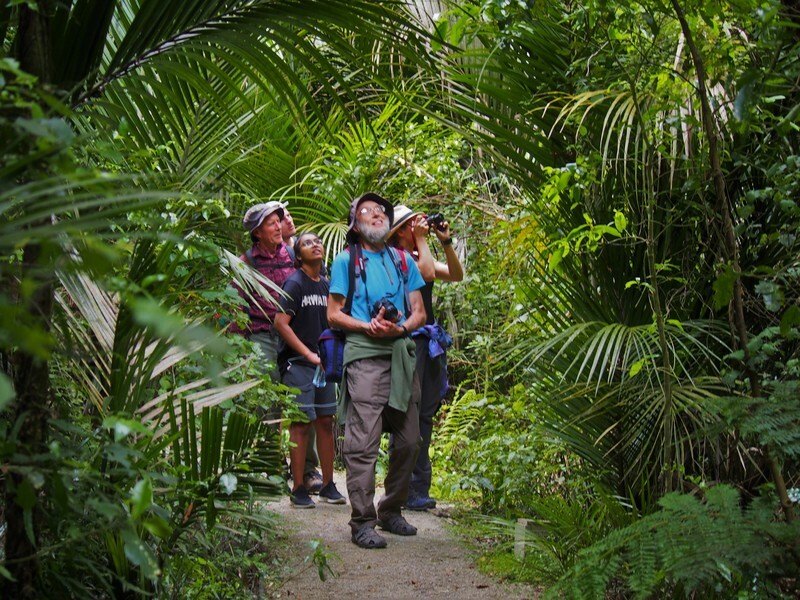 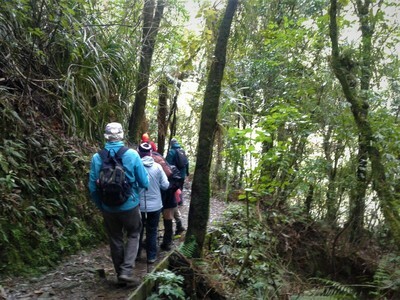 This Forest and Bird walk was included as one of the activities of Conservation Week 2018. 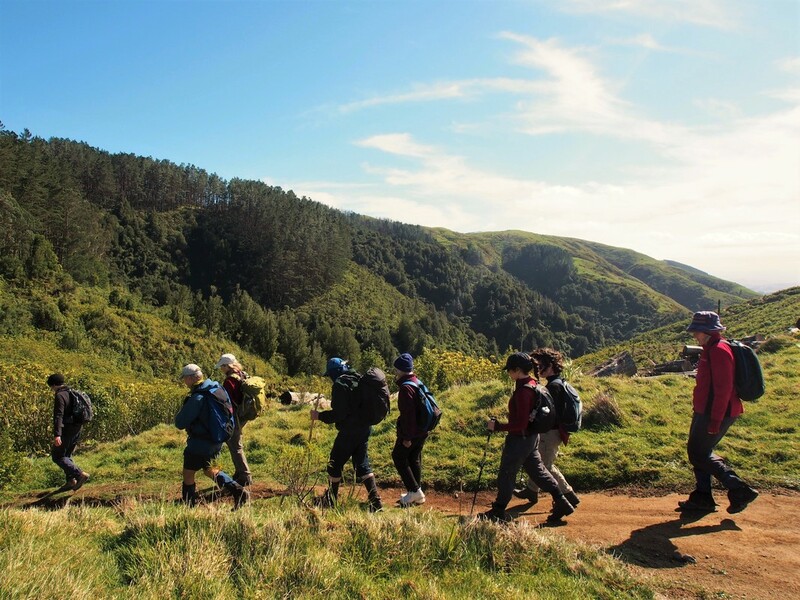 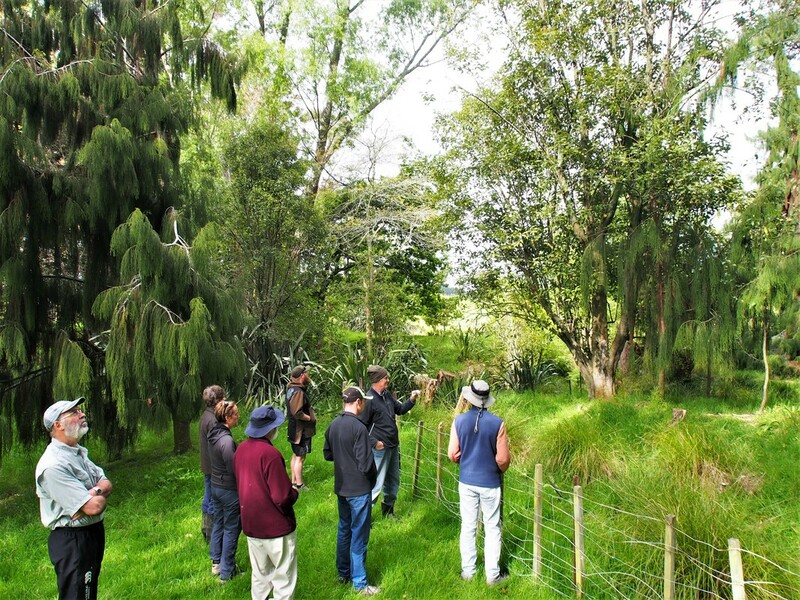 This meant 15 people travelled in 4 cars to the end of Scotts Road to find out more about Arapuke Forest Park. More local people arrived and our numbers swelled to 17. 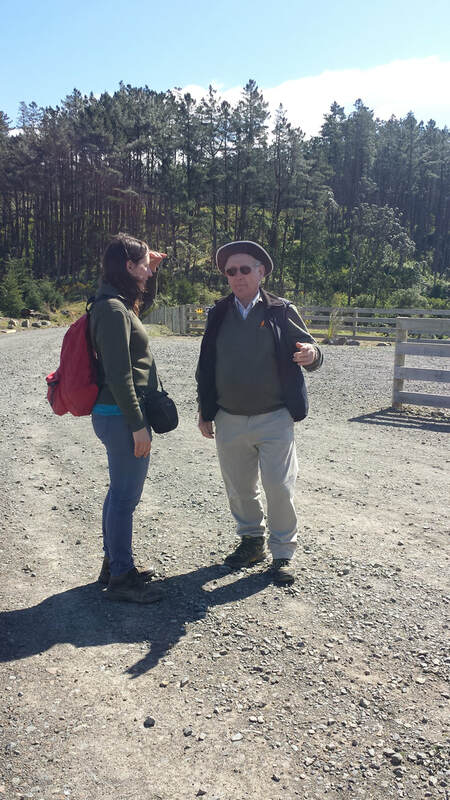 Ian Argle had kindly agreed to take us down the Back Track. 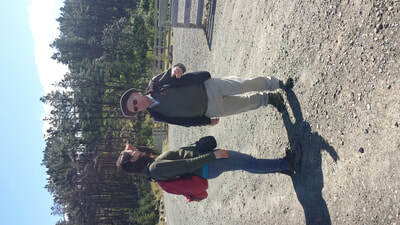 We were entertained with his interesting stories which were interspersed with snippets of history of the area. 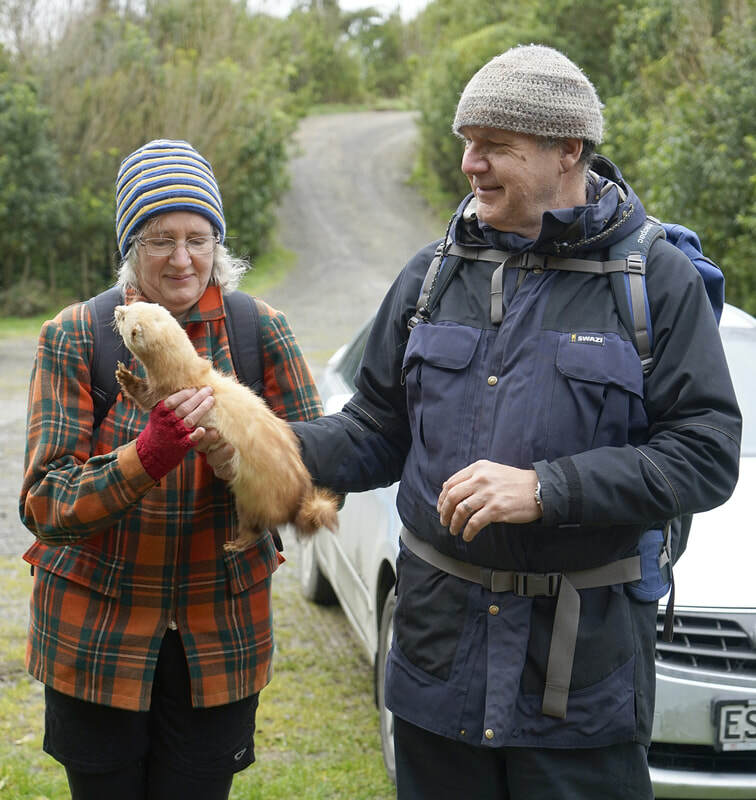 At the start of the trip, we met in the shelter. 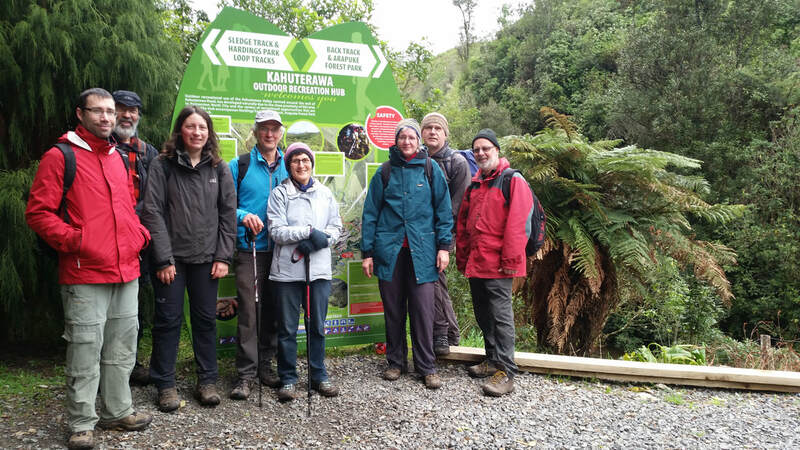 There, Ian talked about how we would be walking part some of the Te Araroa Trail and how the shelter fitted in with providing shelter in wet weather. 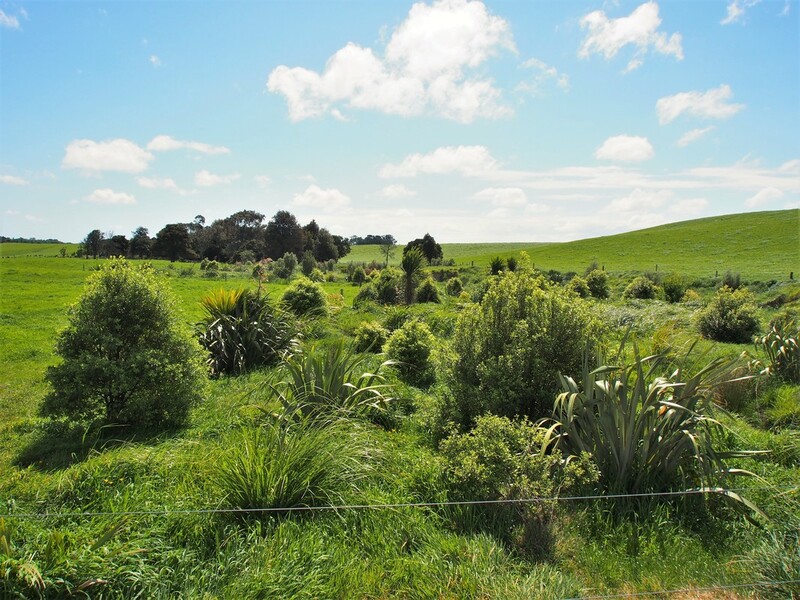 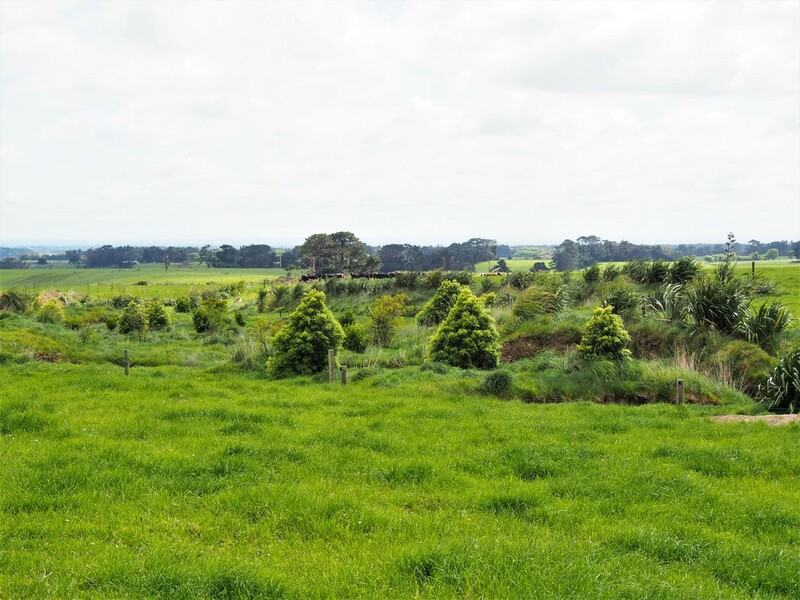 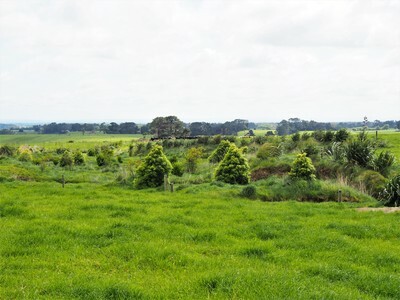 He talked of his mother who had purchased a local farm in 1947 and then he talked about the regenerating bush and his vision of creating an outdoor area that would benefit many people. Once we were out of the cool wind we walked down the Back Track, stopping to listen to Ian talk about the podocarp forest, the powelliphanta snails and all the local stories that made you want to listen to more of them. For example, when Ian was attacked by the local karearea while he was talking on his cell-phone; why a piece of land was called The Common, who was Arapuke and where was he born? 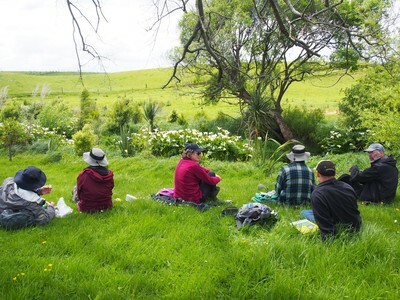 We had lunch at the top of the central part of the Arapuke Park while mountain cyclists whizzed along the trail behind and in front of us. 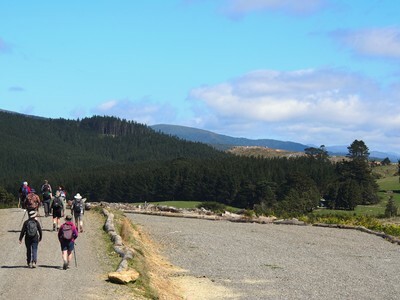 Finally, we had to walk up the last big hill of the gravel road to loop back to the carpark. 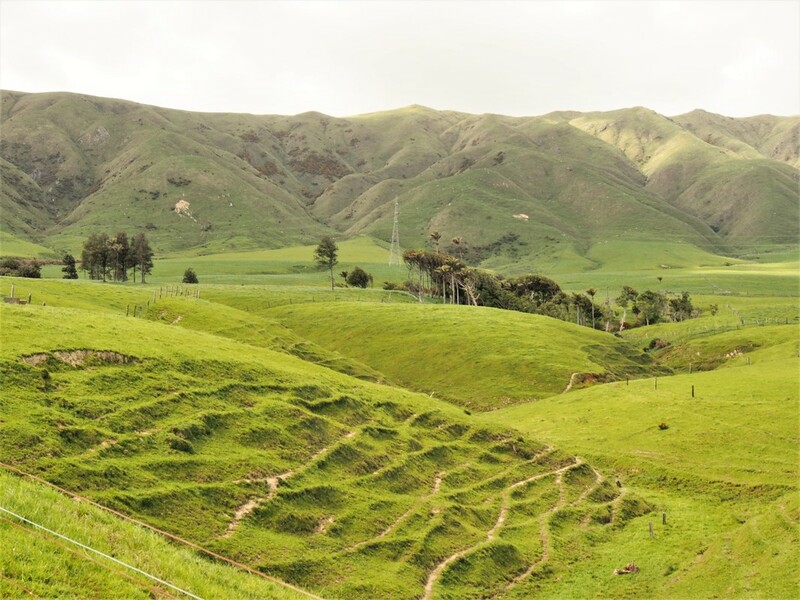 On the way to Coppermine Creek, we peered out of the car windows wondering whether we were going to get rained on today. The Coppermine Creek carpark shelter was occupied by a table loaded with interesting items. Abi from the Department of Conservation took the opportunity to introduce NZ Predator Free 2050 to us. 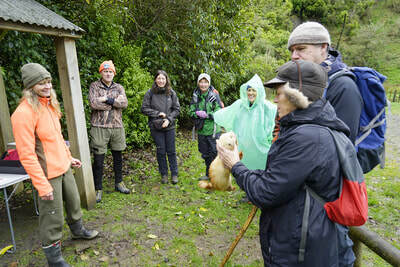 She introduced her assistant, the stuffed stoat, to us and we got to have a very good look at him. 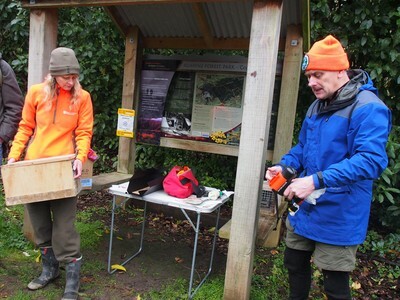 Ian and Abi had brought some traps and tools along and demonstrated how to operate them. We had a go too - easier than we thought! 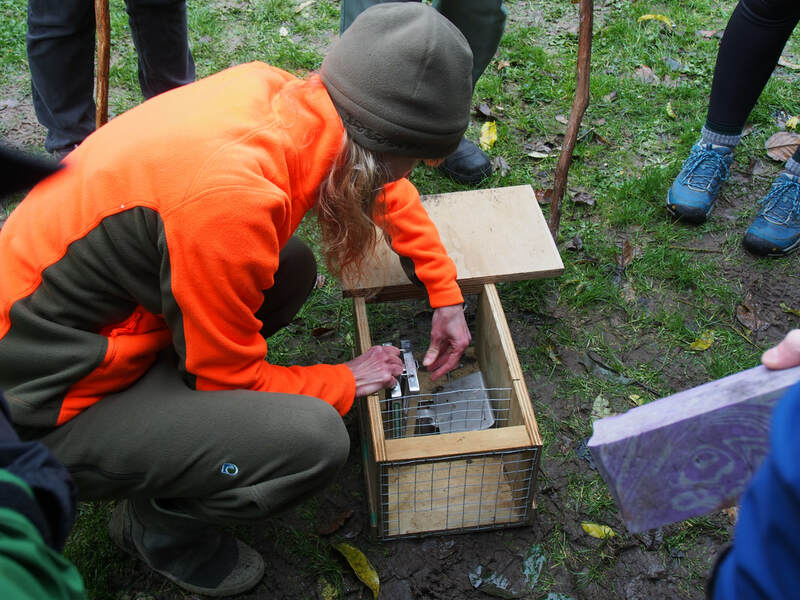 Abi talked about DOC´s traps library and how she tries to get schools and community involved in trapping. 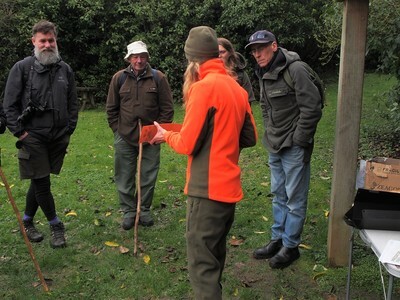 Ian told us more about the Ruahine Whio Protection project. 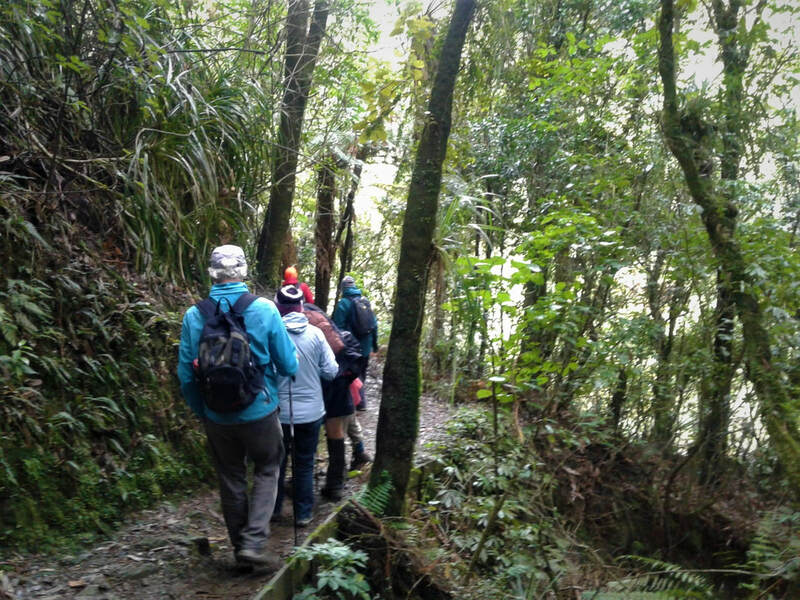 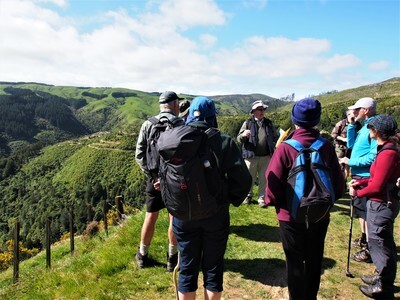 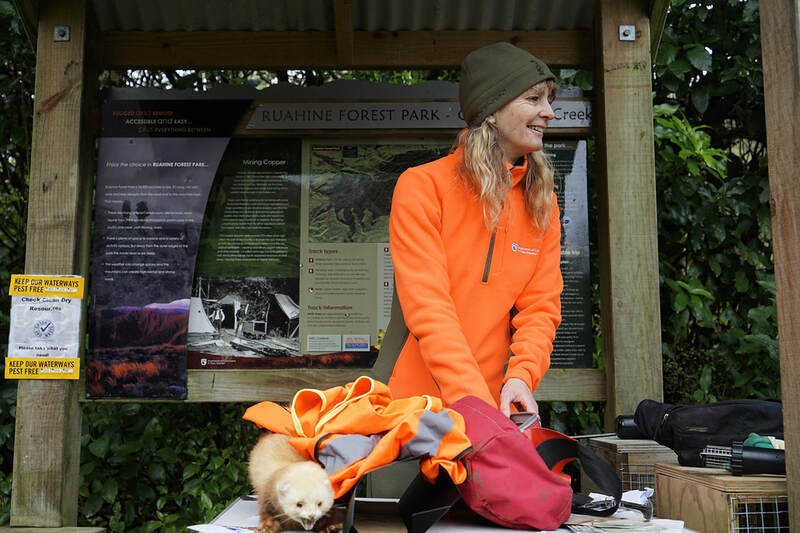 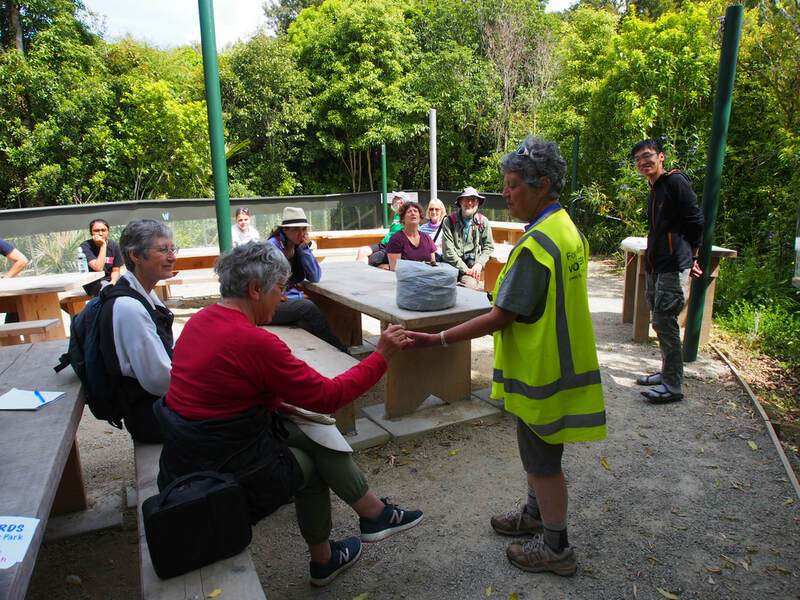 He explained how and where the volunteers maintain trap lines and about their vision of expanding the project to the entire Ruahine and Tararua Forest Parks. Therefore, the Ruahine Whio Protection Trust is one of the many community groups working on the Manawatu River Source To Sea project. 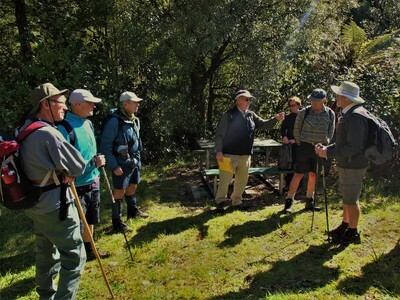 Ian wants to try to get keen trampers, walkers and runners involved to check and rebait traplines while they use the tracks. 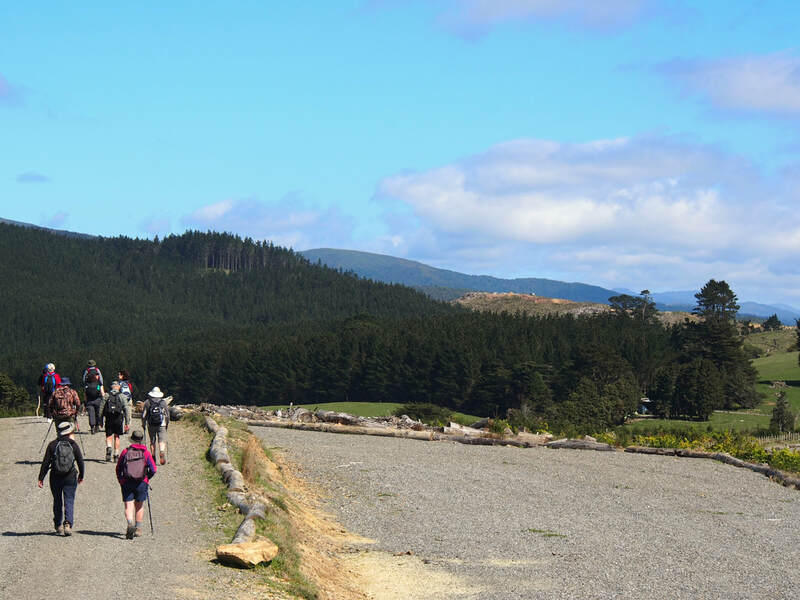 As everyone started to cool down from standing around the traps and handing around rabbit bait, our group of 11 took off to explore Coppermine Creek. 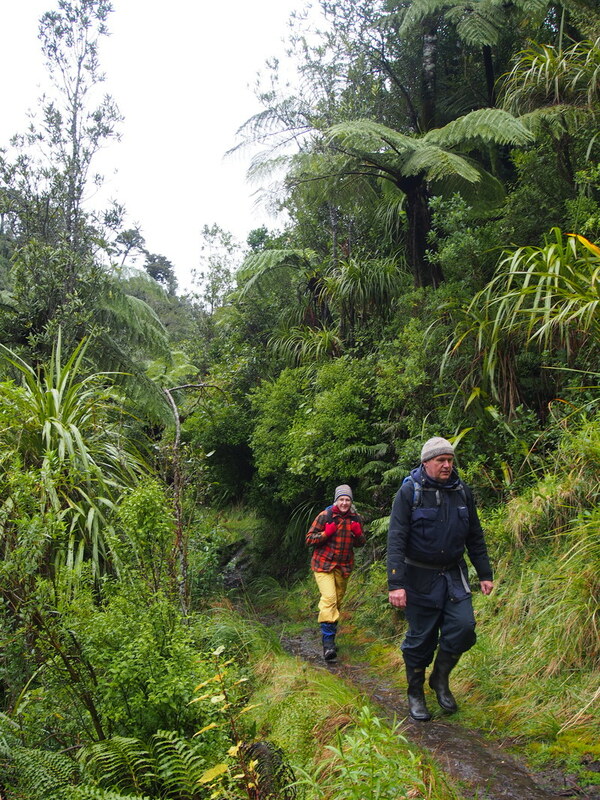 The narrow track followed the steep bank of Coppermine Creek through nice bush, interrupted by a couple of clearings. 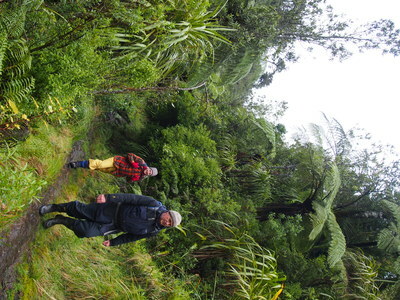 After half an hour we reached the track junction, where Ian told us some details about whio and their habitat. 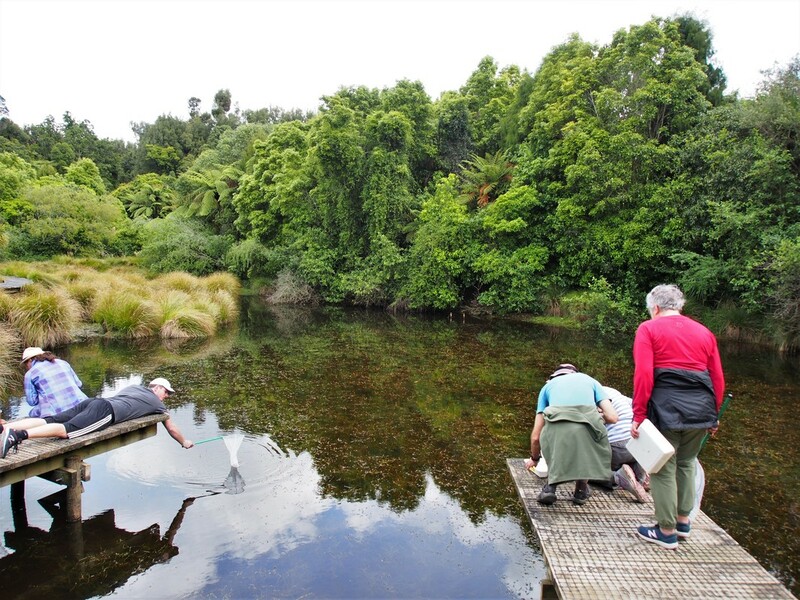 Coppermine could be a potential habitat for our endangered blue duck, but they would only have a chance to survive if we can eradicate some of the predators by establishing a trap line. 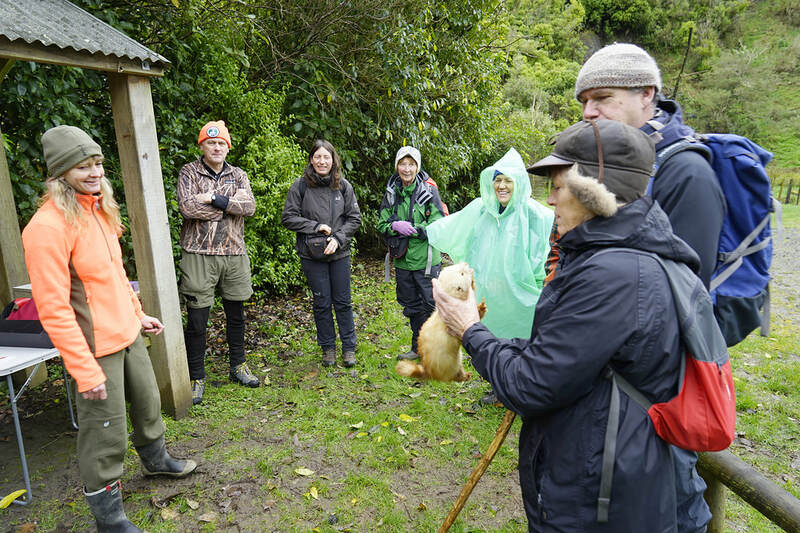 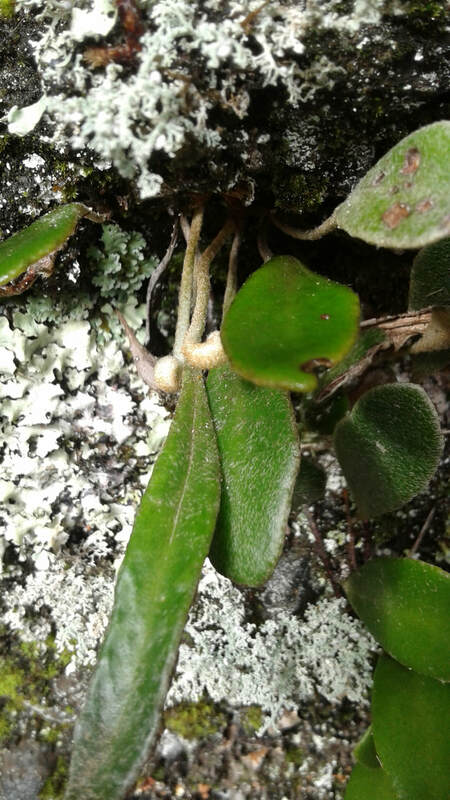 We returned to the carpark and home without getting to use our rain gear - But with a good idea about trapping and its importance for NZ´s native taonga species. 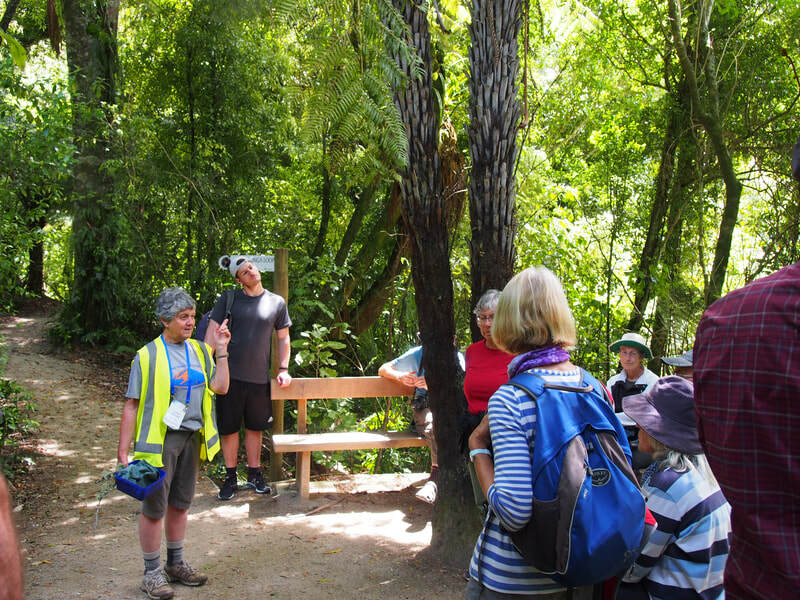 Before starting the walk, Viv did an explanation of the history of the Sledge Track and development of Arapuke Park. 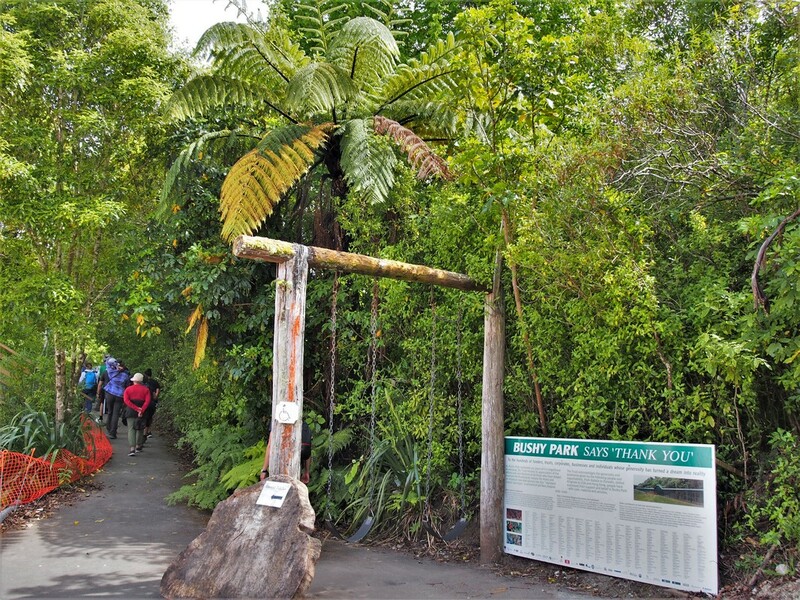 The Sledge Track has been opened in 2003 after being restored by Ian Argyle and volunteers. 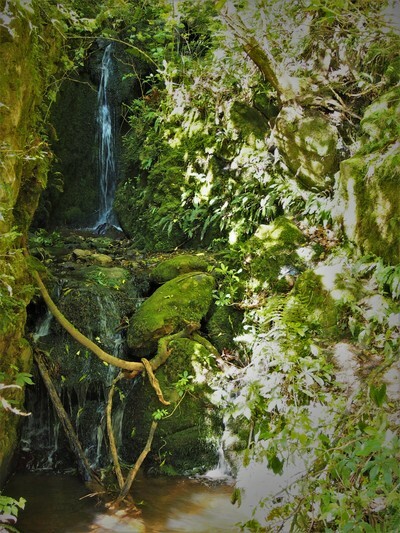 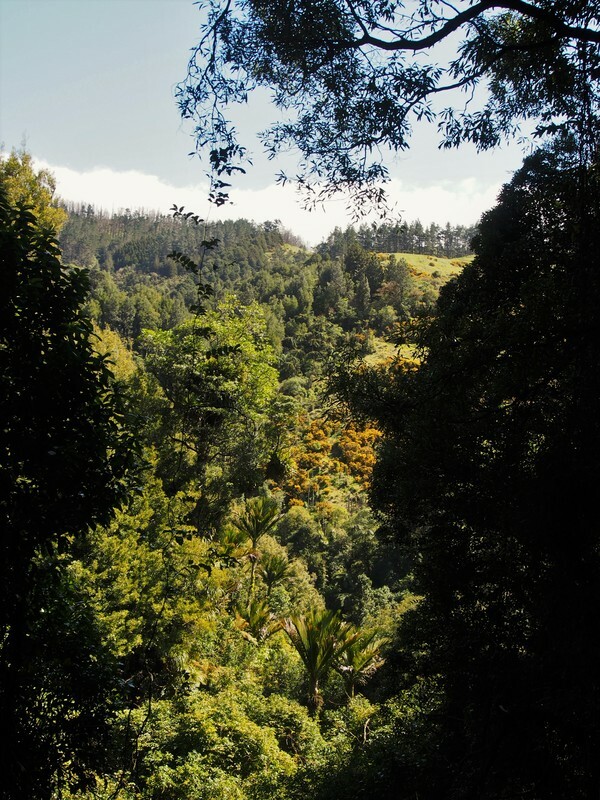 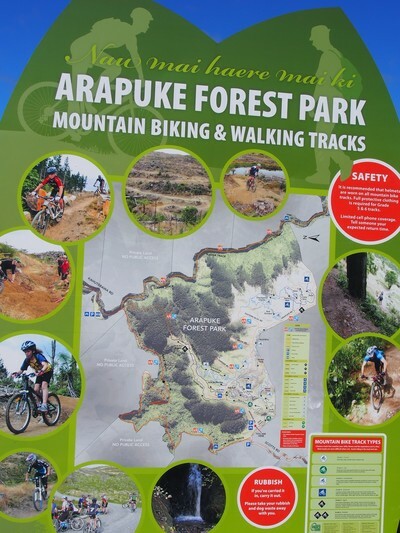 Arapuke Forest Park has more than 20 km of trails for mountain bikes. 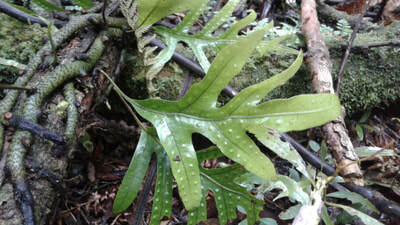 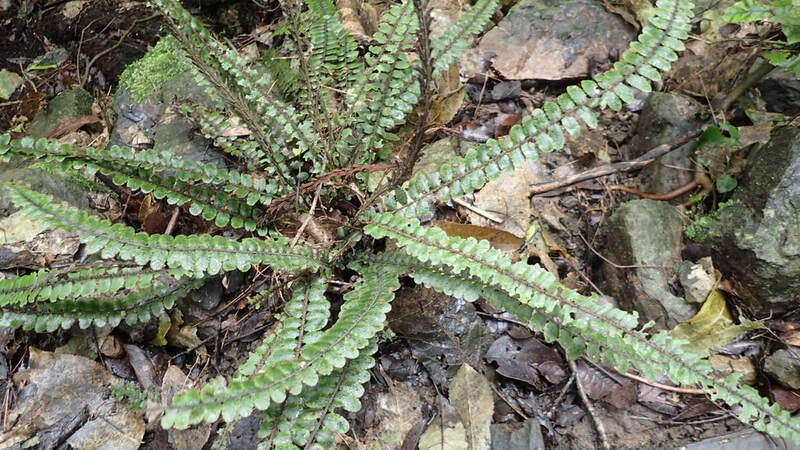 Walking from the car park, we only had to walk a short distance to spot the first examples: houndstongue (genus Microsorus), blechnum (or hard ferns) and mamaku (genus Cyathea). 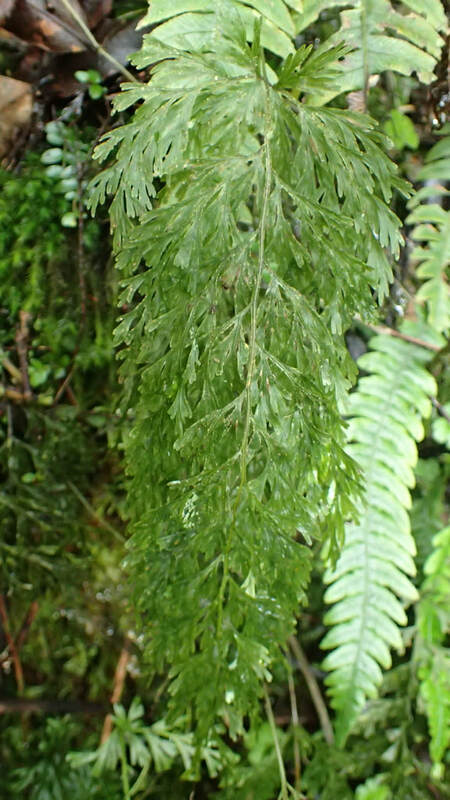 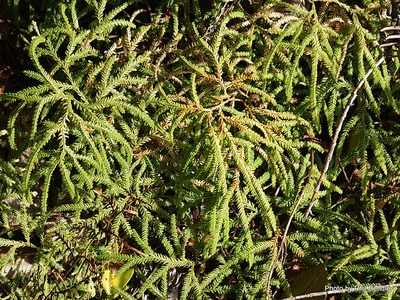 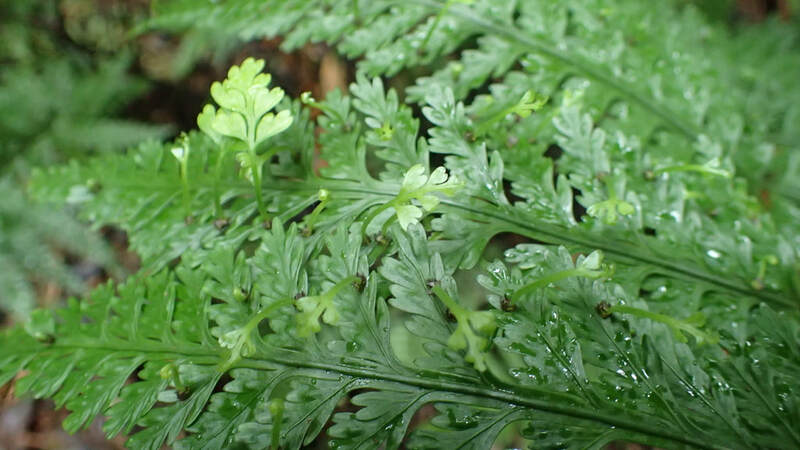 A little bit further down we could find filmy ferns (genus Hymenophyllum), hen and chicken ferns, spleenworts (genus Asplenium) and ponga (genus Dicksonia). 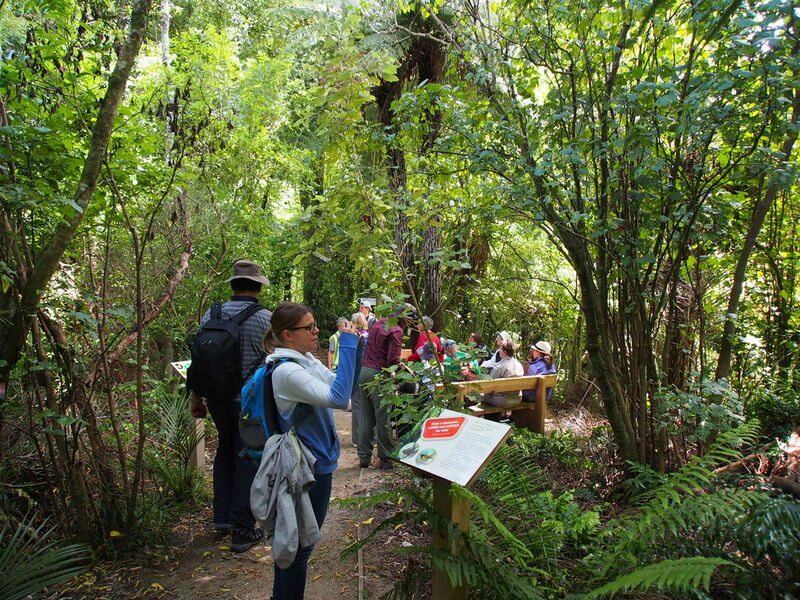 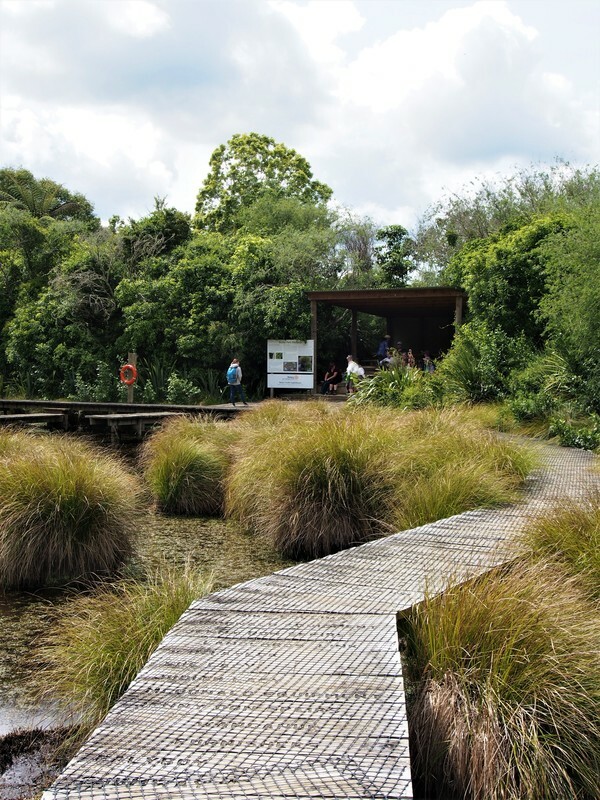 It was a relatively slow walk as we were surrounded by ferns and were learning and looking for new examples and different kind of ferns.We had lunch at Pritchard’s landing and we admired the new swing bridge that is now in place for people to return to the car-park via Arapuke Park. 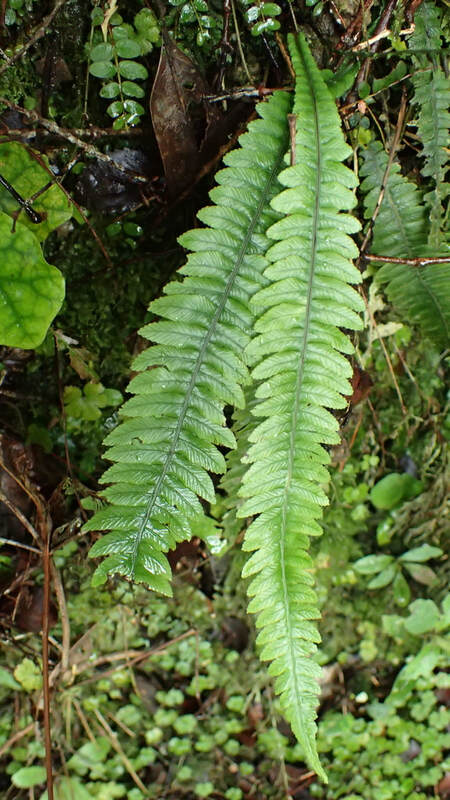 At the end of the walk, Viv had set us a target to learn 6 ferns each and we were all successful. 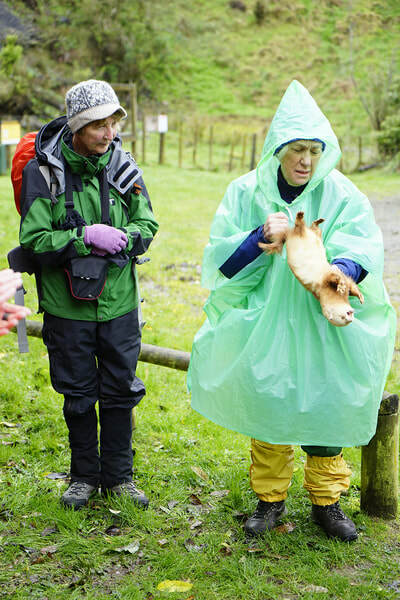 We all had an enjoyable time and learnt a lot from Viv and Keith.